So, I’ve been thinking about leaving WordPress for a while now. This has nothing to do with WordPress itself, since I really love this blogging platform. But I am just not happy with the design of this blog. I actually never was. And since WordPress.com doesn’t allow me to buy and install the template that I want (apparently, it only works with WordPress.org), I decided to move to Blogger. It wasn’t an easy decision, but I have finally made it. The only problem is that I cannot import my WordPress blog posts to the new one. Apparently, the conversion process has been discontinued, making it impossible for me to import all of my posts to my new blog. Still, I have made the decision to move to Blogger nonetheless. If you want to continue to follow me there, it would make me very happy. If not, that’s okay too. Anyway, I just wanted to let you know. Disclaimer: I received this review copy for free from the publisher Usborne in exchange for an honest review. However, this fact does not affect my opinion of the book or the content of my review. When I first heard of this book I was intrigued because it sounded like a fun read about books, authors and conventions. Thus, I really wanted to read Unconventional and I am glad I had the chance to do so because this novel was really entertaining and engaging! Lexi was such a likeable protagonist; she was smart, but also flawed and I could totally identify with her because she seemed real and authentic. Aidan was also a great character and I loved finding out more about him and his book. The romance between Lexi and Aidan was right up my alley since it was so sweet and innocent. It wasn’t insta-love, but rather a slow romance and I really appreciated this fact. I really enjoyed Lexi’s and Aiden’s conversations and rooted for them until the very end. I also loved the supporting characters in this book, especially Lexi’s best friend Sam. Their friendship felt so genuine and I just enjoyed reading about these two. 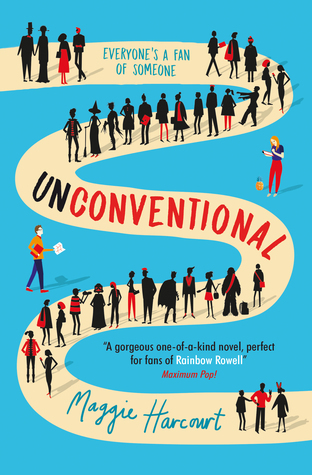 What I also liked about Unconventional was the fact that it was not just a romance novel but a book about friendship, family and ultimately about growing up. Maggie Harcourt gives us readers a glimpse inside the world of conventions and I have to say I really found this world very intriguing. I have never attended a convention before, but after reading this novel I really want to go to one. All in all, I really loved Unconventional and devoured it in two days because it had all the things I love in it – a sweet romance, great, relatable protagonists and an awesome setting! I totally recommend this novel to everyone who loves Rainbow Rowell’s books and contemporaries in general! Note: I would like to thank Usborne for giving me the opportunity to read and review this great book! Hello everyone! 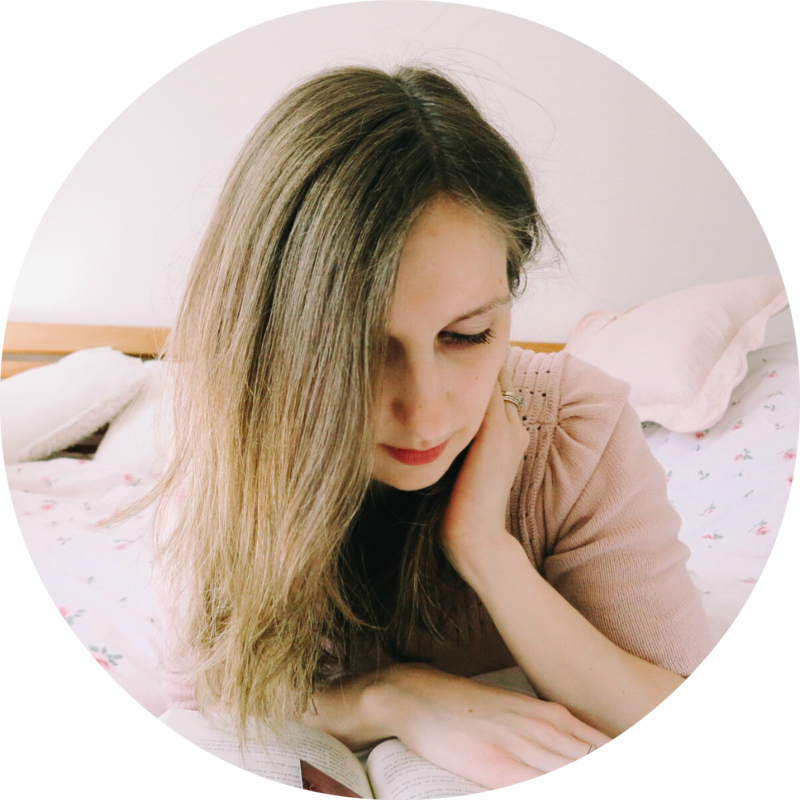 I know I haven’t blogged in a long time, but I also have a German book blog and sometimes it’s hard to find the time to write posts and reviews for both blogs. Anyway, since 2016 is over, I thought I’d share my favorite reads of 2016 with you. 2016 wasn’t a good reading year for me. Normally, I read over 100 books in a year, but this year I wasn’t really in the mood for reading and that’s why I only read over 70 books. And somehow, I read a lot of ‘okay’ books, but not too many awesome books. So three out of five of my favorite books of 2016 were written by Sarah J. Maas. Surprise, surprise. Not. It’s really no surprise since she’s one of my favorite authors and I really love her books! So what are your favorite books of 2016? Let me know in the comments below. Disclaimer: I received this ebook for free from the publisher via Netgalley in exchange for an honest review. However, this fact does not affect my opinion of the book or the content of my review. I am a sucker for a good mystery story because I just love to guess what happened before the truth is revealed. Thus, I was really excited to read With Malice because it sounded like my kind of book. Jill and Simone have been best friends forever, but when Jill wakes up in the hospital she can’t seem to remember the last six weeks of her life and she is shocked to learn that her best friend has died in a car accident – an accident that might not have been an accident at all. The more we learn about Jill and Simone, the more we realize how different these girls are. Jill is interested in art and history, and she loves to read and to study, while Simone loved to party and to be the center of attention. Nevertheless, they got along well and were inseparable. But something happened between the two while they were in Italy and soon we learn that there was a boy involved. As Jill puts the pieces together we find out that their friendship wasn’t at all as perfect as it might have seemed. I did sympathize with Jill, after all I felt sorry for her. She did not only lose her best friend, but she also couldn’t remember a single thing about Simone’s death. Still, there was something off about Jill, and that’s why I didn’t like her 100 %. And although the mystery aspect was interesting and kept me reading and guessing, I still found this novel to be slow-paced. I just hoped With Malice would be suspenseful and full of twists and turns, but unfortunately, it was somehow predictable. Maybe With Malice reminded me too much of another book I’ve read in the past, namely Dangerous Girls by Abigail Haas. I just think that while With Malice was certaintly an entertaining read, it wasn’t unique. And the ending was unsatisfactory as well, at least for me. All in all, this novel was interesting and had a nice setting; however, it was too slow and predictable for my taste. Note: I would like to thank Netgalley for giving me the opportunity to read and review this book! Disclaimer: I received this book for free from the publisher Harper Collins in exchange for an honest review. However, this fact does not affect my opinion of the book or the content of my review. The movement is all that matters. For as long as Samantha can remember, she’s wanted to be a professional ballerina. She’s lived for perfect pirouettes, sky-high extensions, and soaring leaps across the stage. Then her body betrayed her. Even though I’ve never danced before I’m really fascinated by ballet and thus, I really wanted to read How It Feels to Fly since it revolves around a ballerina with weight issues. Sam, our heroine, is sent to a summer treatment camp because she suffers from panic attacks and anxiety. She started having these issues when she gained weight and now Sam is struggling with her body image. You cannot help but feel for Sam since she’s dealing with a lot – she hears this nasty voice in her head, telling her mean things all the time – that she’s fat, that she’s weak, that she’s ugly – and she believes all this stuff, so it’s really hard for Sam to accept her new curvy body or to open up to people about her problems. And it’s no wonder that Sam is afraid of telling people about her issues, after all, her own mother urges her to lose weight and has told her indirectly that she’s fat. The panic attacks felt very real, as well as Sam’s thoughts and her anxiety. Sam acted like a real person, and not just a fictional character. Therefore, the author did a great job developing such an authentic main protagonist. I liked the fact that Sam made new friends at the summer treatment camp because she really needed supportive people in her life, people who understood her and listened to her. There was a little bit of romance in this book, but I won’t talk too much about it since I don’t want to spoil you. All I can say is that I saw it coming and that I am glad things worked out for Sam in the end, even though things didn’t quite work out the way she was expecting them to. All in all, How It Feels to Fly was an emotional read with a deep meaning, and I recommend it to everyone who likes ballet or likes books dealing with mental health. Note: I would like to thank Harper Collins for sending me this great book for review! I requested this book from the publisher because I read and enjoyed the author’s other novel The Survival Kit . Unplugged is very different though since it’s not a contemporary, but a dystopian / sci-fi novel. Skylar was a likable character and I really sympathized with her because she felt alone in the App World since she missed her real family. I liked that she was brave enough to leave the App World even though it was very risky and dangerous. And Skylar continues to be brave throughout the book and to do the right thing, and that’s why I admired her. Skylar’s love interest was okay, but I felt that there were still a lot of things about him that we don’t know and I just hope that we’ll get to know him better in the sequel. The world building is a little complex because of these two different worlds, but I really found the idea of the App World intriguing and I wanted to find out more about its emergence. The plot was suspenseful and there were definitely some interesting twists and turns, as well as an ending that leaves you wanting more, but I still felt that the story wasn’t really unique. Nor was it addicting. Or maybe it’s just me, maybe I just read too many dystopian / sci-fi novels and suffer from dystopia / sci-fi fatique, who knows? All I know is that Unplugged couldn’t fascinate me 100%. Still, it was entertaining and suspenseful, and it really made me curious about the sequel. So if you’re a die – hard dystopian / sci-fi fan I totally recommend this book to you because it deals with a very interesting topic and makes you think about certain matters. Note: I would like to thank Harper Collins for sending me this book for review! I discovered this book on Instagram and I immediately wanted to read it since I’m a sucker for cute covers and mysterious stories. And I’m so glad that Tell Me Three Things was not only beautiful on the outside, but also on the inside. I totally loved this novel and I am so glad I was not disappointed. Jessie has lost her mother two years ago and she still grieves a lot because she still misses her mom. And the fact that her dad remarries and Jessie has to move to California all of a sudden makes it even harder for Jessie to come to terms with her loss. Therefore, I could totally feel for Jessie, could understand her frustration, her anger and sorrow. The author did a great job creating a main protagonist that seemed real, and not one-dimensional. Jessie’s grief felt real, her emotions seemed genuine and that’s why she felt very authentic to me. Moreover, Jessie is really likable because she is humble, smart and hard-working. You can’t help but root for her and SN. SN is someone who emails Jessie and offers her advice regarding her new prep school and fellow students. At first, Jessie doesn’t know if she can trust SN, but then she begins to chat more and more with SN and she soon realizes that she’s falling for him. There’s only one problem – Jessie is afraid that SN might be someone she doesn’t really like in real life. I loved this whole mystery revolving SN. I just adore such ideas because I like to guess and see if I’m right. And most of the time, I am. I had my theory regarding SN and what can I say – I was right. And I am so glad I was because like Jessie, I would have been so disappointed if SN was somebody else. There are several guys who could be SN, but still, there’s no love triangle (or should I say love square?) in this novel. And I loved Tell Me Three Things so much more because of this fact. The romance in this book is so sweet and swoon-worthy, and I just loved everything about it. Altogether, this novel is so cute, so emotional and heart-wrenching that you’ll want to hug it multiple times. At least that’s what I did. 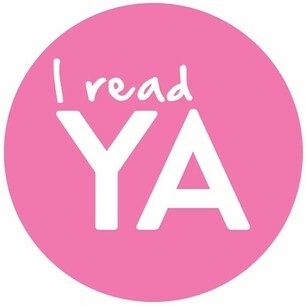 Overall, Tell Me Three Things was such an adorable YA novel featuring a strong heroine who grows as the story evolves. It’s an intelligent book filled with depth, but it’s also funny and sweet at the same time. A perfect combination, I’d say. You should totally read this book. The ‘Dear reader’ note at the end of the novel is very emotional. The waffles on the cover have several significances in the book. Lately, I’ve been in the mood for contemporaries and since I’ve heard such great things about I’ll Meet You There by Heather Demetrios I was so excited so finally start reading it. I had high hopes for this book and luckily my expectations were met. I loved this novel so much and it’s now one of my favorite YA contemporaries! If you expect a fluffy summery read you’re going to get so much more since I’ll Meet You There is not just a light and cute contemporary, but a book that will put you through an emotional roller coaster! Have you ever read a novel that made you cry, smile, happy and mad at the same time? Well, I’ll Meet You There was definitely one of those books because it brought out all these feelings and I was such an emotional wreck after finishing this novel! Needless to say, I still suffer from a book hangover! Skylar was such a likable heroine and I totally felt for her because she had a lot going on, she had some serious problems at home, some decisions to make and was struggling a lot throughout the book. Still, she was very strong in my opinion and even though she made some mistakes, this fact made her even more realistic and authentic. Josh was – well – he wasn’t as likable as Skylar, to be honest. I didn’t love him 100% because, let’s just face it – he was messed up. He has done some pretty bad things and I honestly wanted to slap him a few times, BUT he also was really sorry about his stupid actions and knew that he screwed up. The love story between Skylar and Josh was so freaking swoon- worthy and I just wanted them to be together and to live happily ever after! I just shipped Skylar and Josh so much and when they finally became a couple I felt like doing a victory dance. What I liked about I’ll Meet You There is the fact that it did not only revolve around Skylar and Josh’s romance, but that it also explored other aspects such as friendship and family. These relationships weren’t perfect, but rather very real and authentic, and that’s exactly why I liked this book so much. All in all, I’ll Meet You There is a very emotional read featuring two realistic main protagonists that you’ll ship until the end even though they’re far from perfect. I totally recommend this book to everyone out there who loves contemporaries that deal with serious issues and have a deep meaning. InstaLove – I really have a problem with it since it’s never believable. Unrealistic protagonists – I just can’t stand characters that seem unreal and unauthentic. Underdeveloped protagonists – I don’t like to read about characters that don’t undergo a change throughout a book or never grow. I have only read the first Harry Potter book (when it came out) but have not continued with the series (I know, shame on me!). And now I feel like I’m too old to start reading it. Sometimes I read the last page of a book even though I just started the book. I only do this when I love a book though, just because I can’t wait to find out how the story will end. I never buy a book without reading the plot summary because I need to know what the book is about. I can’t really remember, but I must confess that it happened quite a few times. Whenever I read a very emotional book, I can’t help it. Only one – The Bible. My current read is always sitting on my book shelf. It depends. Usually, I don’t snack while I read, but sometimes I do want to eat something, and then it’s either chocolate or popcorn. I read hardcovers with the dust jacket on. 4 stars - Really great! 2 stars - Not so good! 1 star - Really bad!